This is pretty much the stock KDE with very few tweaks to the interface. I moved the task bar to the left side of the screen and set it to be partially transparent and to act a little more like a cross between the CDE and Mac OS toolbars. 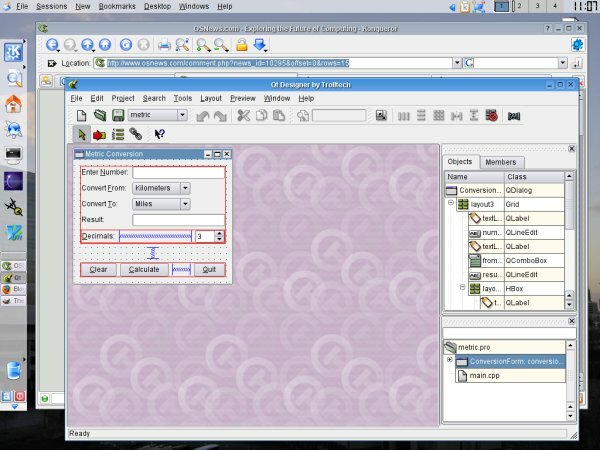 I turned on the global menu option and dragged several of the toolbar applets to the top-right of the screen. 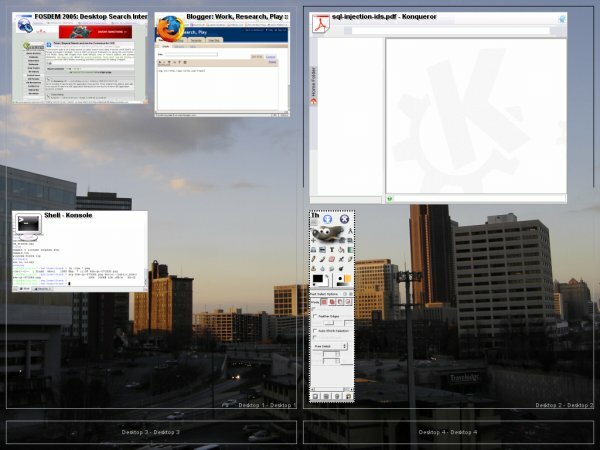 I installed Komposé from the FreeBSD ports collection, which allowed me to assign hot corners so that by simply hovering the mouse pointer over either the top or bottom right-hand-side of the screen I can see all of the windows open across all virtual desktops. The Mac OS users will instantly recognize this as similar to Expose and it is indeed a good way to visually track windows on the system. This is not a review of KDE, just me stating that I like it. I expect to spend some more time playing around over the next few months. Perhaps I will end up with an Apple laptop sometime next year. The long battery life and UNIX environment would be very helpful for me. I am really look forward to finding better ways to organize and work with my data. Project Tenor seams very interesting indeed. The OS News article is a good place to start to look at it. The prospect of not only being able to find data but to automatically discover functional relationships among data is a very interesting idea. Well, that is enough for now. Back to work.